It’s not all business for Clemson football, and that’s just how head coach Dabo Swinney likes it. Jack Ford reports. Coleman Cowan is the producer. Now the Tigers are proving they belong. Their mantra is “All In,” meaning 100% commitment to the program. It took them to last year’s national championship game against Alabama, and has Clemson undefeated and near the top of the polls this season. 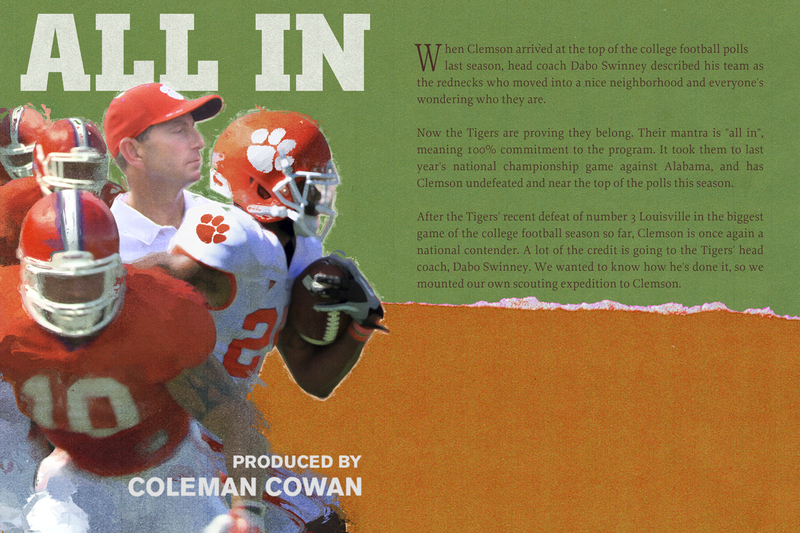 After the Tigers’ recent defeat of number 3 Louisville in the biggest game of the college football season so far, Clemson is once again a national contender. A lot of the credit is going to the Tigers’ head coach, Dabo Swinney. We wanted to know how he’s done it. So we mounted our own scouting expedition to Clemson.